Check-in will be between 6 and 7 pm and the event goes until 8 pm on Sunday. We should have some great prizes for the winners. We are also partnering with the Indie Speed Run guys this year, so if you want to enter your game into that competition as well you can. We'll be using the same theme as them. However this part is optional as there's a $25 entry fee (per game entry), but the potential prize pool is much higher. Game Jams are a time-constrained game-making competition. In general, the goal is to come out of it with an awesome game you have made by yourself or with a team. If you want more info, check out these articles. The event is free. Though you'll need to pay for your own meals, snacks, etc. Also participation in Indie Speed Run is not free, but is optional. We suggest you bring a laptop computer (for portability), but you can bring in a desktop machine if you like. Note that internet access will be wireless only, so bring a dongle if you need one! Other good items are: food, snacks, toiletries, sleeping bag, pillow, headphones, thumb drives, and generally things that you'll need to survive a weekend trapped with a bunch of geeks. We don't have a limit on how many members can comprise a team, however you'll find that larger teams aren't always better as there's more chaos and coordination work. It's okay to have a team of one person if you want. Teams should be fairly well set by the time the event starts. If you need help finding a team let us know and we may be able to help. Also if you are entering the Indie Speed Run, your team size is limited to four people. Lunch on Saturday will be provided by Ninjabee, but outside of that you'll need to provide your own meals. They can be brought in or there are a number of stores and food establishments near the university. There are drinking fountains and restrooms available. The winners will be determined by a panel of judges, except the Audience Choice Award which will be voted upon by the attendees. All games will need to incorporate the theme which will be announced during the kickoff meeting at the start of the event. At the end all games will be submitted to the website and each team will be able to present their game to the judges and everyone for about 5-10 mins per team. After that the judges will deliberate and the award ceremony will follow. (FYI - These categories could change before the event, but it's unlikely). All entrants will have 48 hours (roughly) to develop as much of a game as is possible (preferably fully playable). The entirety of the game must be conceived, designed, built, and uploaded within the allotted time. Entrants must be prepared to show their progress at the end of the 48 hours. Entrants may choose to organize teams with any other entrants they choose. Entrants must have rights to all presented game assets, including: art, sfx, and music. Entrants may use any freely available programming frameworks, tools, and engines, as well as from their personal library also. Entrants must incorporate the randomly selected theme of the jam. Entrants are expected to be respectful to others and the building during the jam. No alcohol or drugs are allowed in the building, and any smoking will have to be done outside. For those competing in the Indie Speed Run (optional), here are some important details about the start of the event. The theme will be revealed when the organizer presses "start" on the Indie Speed Run (ISR) website. All teams that are participating MUST have linked to our location and purchased a credit BEFORE we press "start". 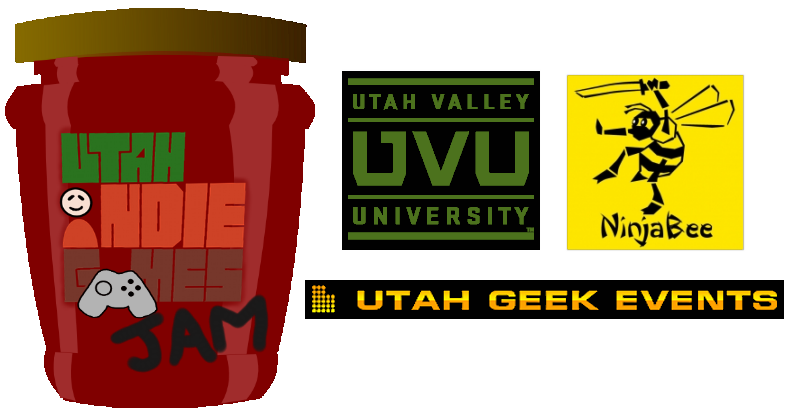 To link to our live site, login to the ISR site, click on "Live Jams", find "Utah Indie Game Jam 2015" and then click on "+SIGN UP". Once we press START there is no going back. The theme for our location will be revealed and the ISR website will start its countdown. Teams may have to refresh before seeing the timer and the theme. All teams at the site will have the same start and end times. Each team at the site will have the same THEME but will each have a different random ELEMENT. If you really want, you can roll the "danger dice" to get a new random ELEMENT. "This game was developed as part of Indie Speed Run 2015 (www.indiespeedrun.com)." We offer a big big Thank You to our sponsors! A film noir detective searches an office filled with bad guys. Murderer in the dark style party game.